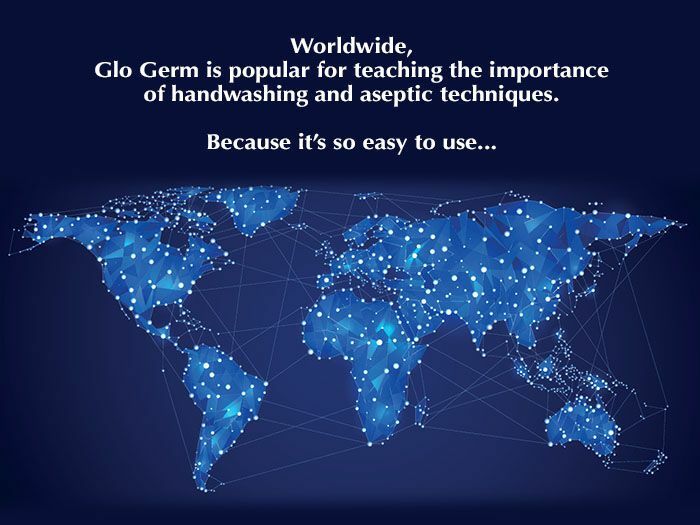 In this age of concern over infectious diseases, security, and liability, Glo Germ™ is an effective tool to demonstrate handwashing, surface cleaning, hygiene, and containment techniques. It is a big mistake to assume that your employees understand the critical nature of these simple processes—you have to teach them! 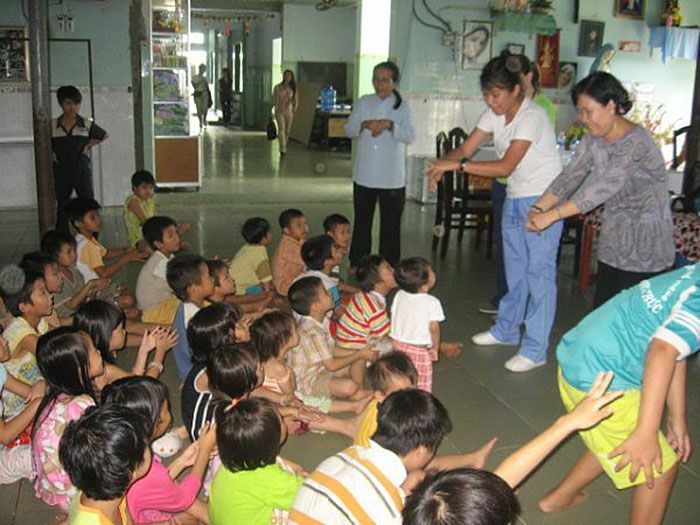 Not enough can be said about the importance of cleanliness, proper handwashing and infection control. 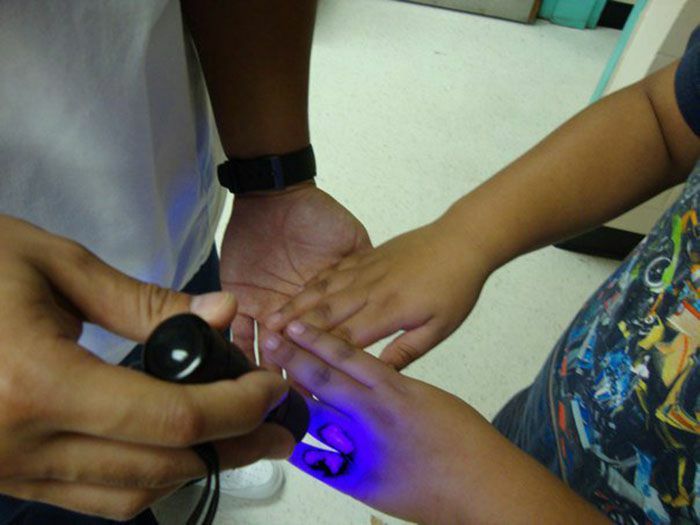 complete with gel or oil, UV lights, Glo Boxes other acccessories, and a complete line of supplementary educational materials. Having trouble with installation of batteries in your UV flashlight? The liquid or gel and the powder contain the plastic simulated germs, and the lamp illuminates them to test the effectiveness of your (and your workers’) practices. 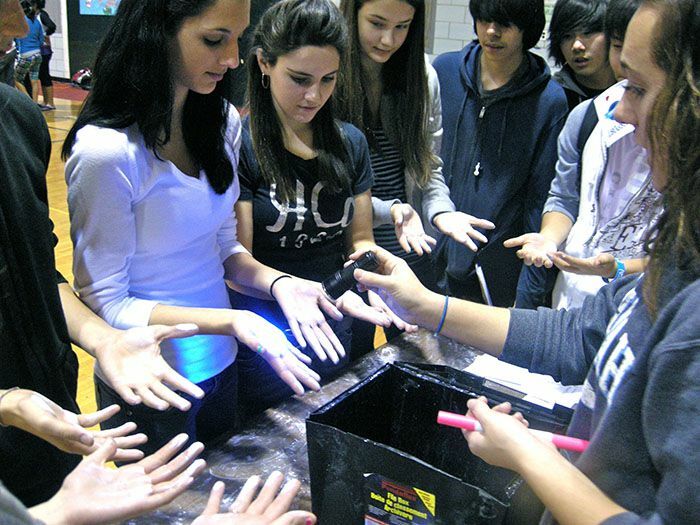 For handwashing training, Glo Germ™ Liquid is rubbed onto one’s hands like lotion. 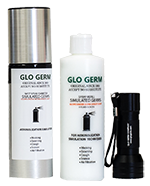 For surface cleaning, dust Glo Germ™ Powder onto surfaces and generally throughout the entire area. Then wash your hands or clean the area as normal. 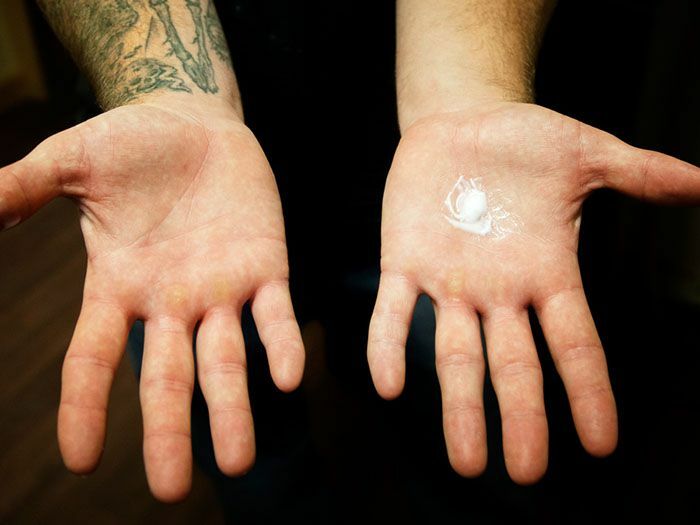 One’s hands and the surfaces appear clean. However, the ultra-violet light tells a different story. The discovery of the remaining germs will cast a new light on your cleaning effectiveness. Protect yourself, your customers, and your bottom line! An aerosol free, easy pump canister for airborne microbe simulation. 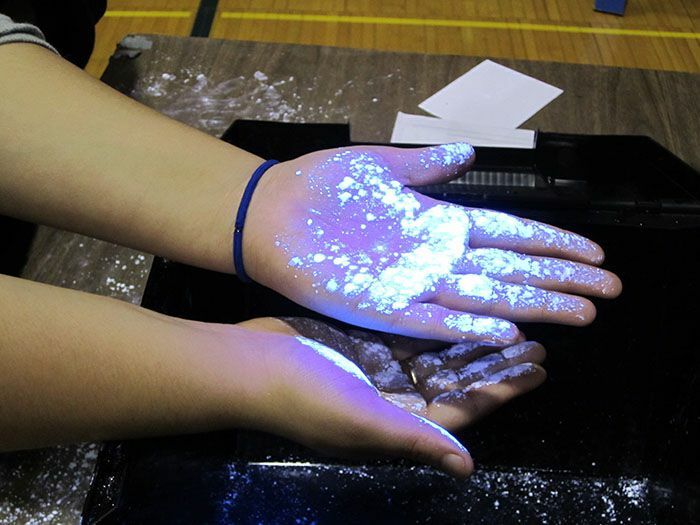 Black Light Experiment: What are you spreading? 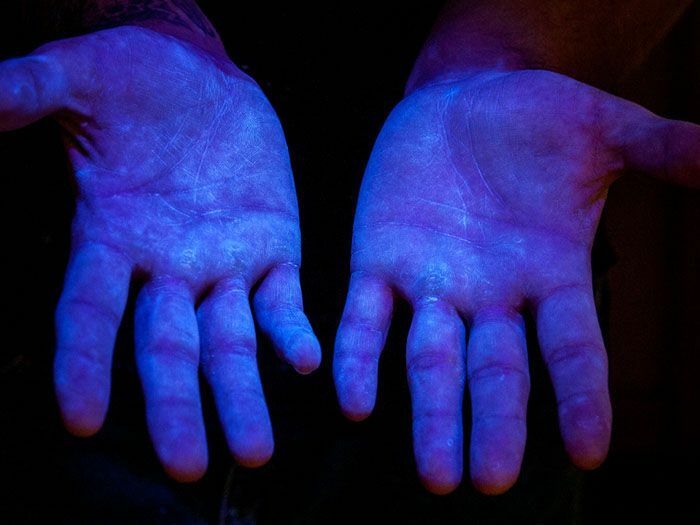 Anchor Lisa Budeau put Glo Germ powder on her hands, went about her day, and then used a black light to show exactly everything she touched. 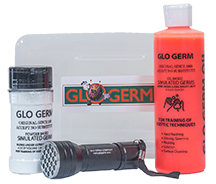 Doctors say the Glo Germ kit is a great eye opener for people. 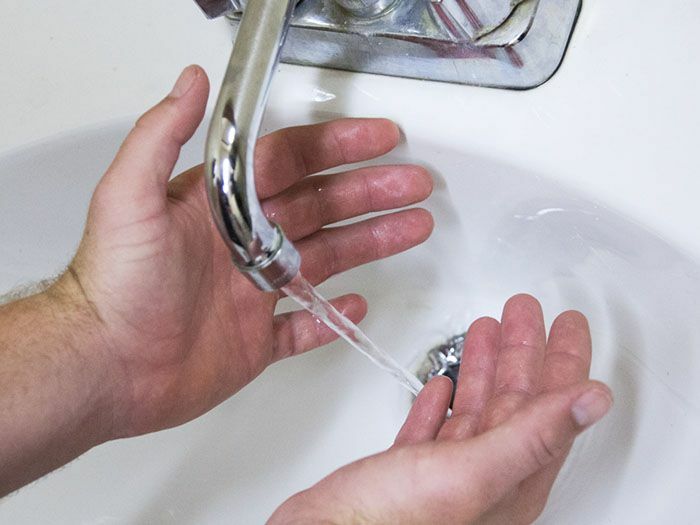 It shows us how many things we touch and how important it is to wash our hands. Sharon Cohen's kitchen looked spotless. The toaster sparkled, the utensils shined and the dishes in the sink looked clean. As the weather gets colder, kids seem to share a lot more germs. 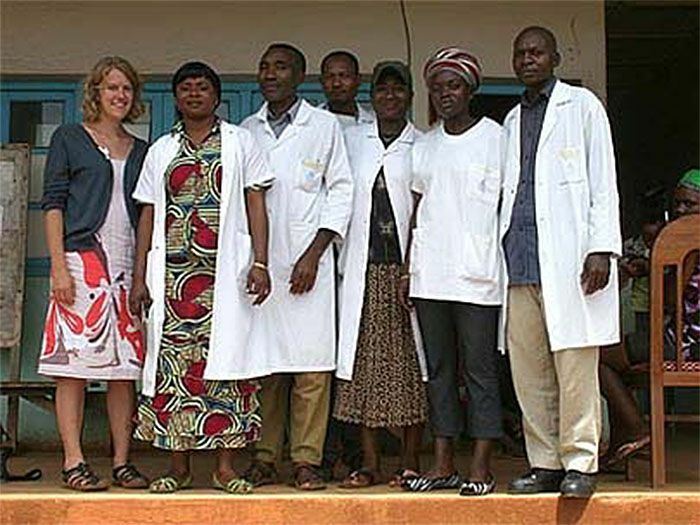 As busy scientists, we don't have time to get sick. 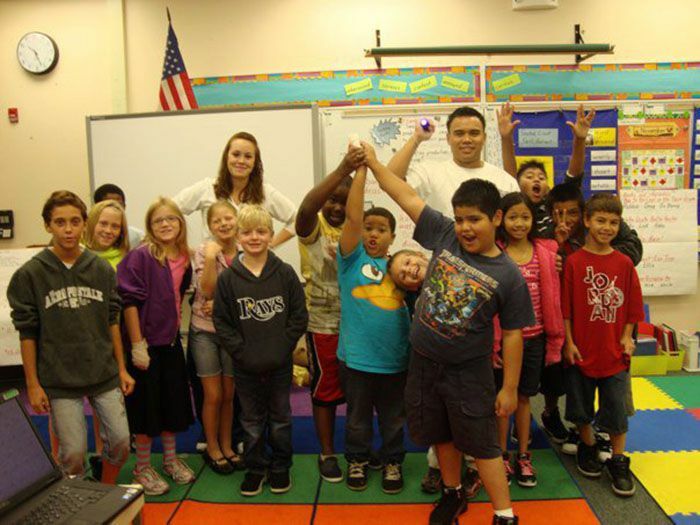 Our DFTV question: how can we avoid spreading germs and viruses to our friends and families? Does it make a difference whether we sneeze into our hands or into our elbows? 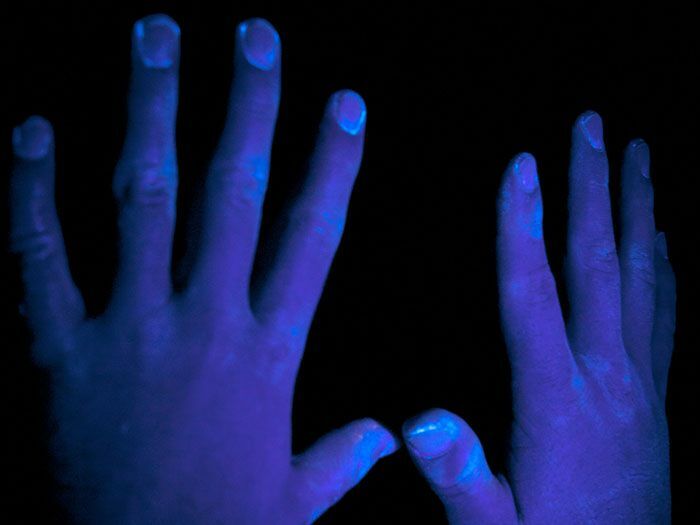 "The simulation coordinator also used Glo Germ, a substance that glows under UV light, to represent the Ebola virus..."
Hand washing shouldn't be that tough, but one study found only 5% of people do it well enough to kill off the germs.